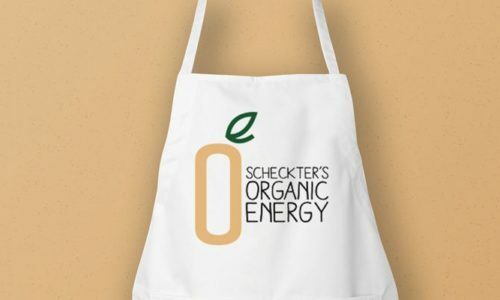 Scheckter’s Organic Energy drink was created in 2010 by Toby Scheckter, a former racing driver and son of Formula 1 legend Jody Scheckter. For Toby, years spent working on the family’s renowned Organic/Biodynamic farm, Laverstoke Park, clearly sowed the seed to create the world’s first organic, vegetarian, and Fairtrade certified energy drink. Sharon contacted us here at Garment Printing in need of some personalised aprons and tote bags for a promotional event for the company. In total they needed 75 aprons and 150 tote bags. They had a very tight deadline, which our express sales teamhandled quickly and efficiently. Due to the design having many colours, we went for a cad cut colour transfer print over screen printing. This was to reduce cost for the client and to speed up production times. Also, as they were unsure about the artwork, the client asked us for a sample before we went ahead with the order. We dealt with this by sending a photograph of the first printed garment as it came off the press. The client approved the first print so we proceeded with the rest of the order. The client was extremely pleased with the service we offered and the quality of the print. The event was a success and they have returned several times for repeat print jobs on an array of different garments.